Quicker, easier and much less messy than classic crumb-coated fish, egg-only fish fingers are a revelation. The egg cooks to a golden coating, somewhere between tender and crisp, which holds all the fish s succulent juices inside. These have become a firm family favourite, especially when served with this simple ricey side dish. Everyone likes it so much as it is that the ketchup stays in the cupboard. Rinse the rice in a sieve, then tip it into a pan and add plenty of cold water. Bring to the boil, reduce to a simmer and cook until tender – about 25 minutes should do it. Stir the sliced spring onions through, along with a squeeze of lemon juice, the lemon zest, a good trickle of extra virgin oil, some salt and pepper, and the chopped herbs, if using. Put the lid on the pan to keep it warm. Now check the fish for pin bones, prising out any you find with tweezers, and cut the fillets into thick-finger-sized pieces or wedges (don't waste any fish trying to trim them into perfect shape). Break the eggs into a bowl, season with salt and pepper and whisk well. Heat a thin layer of oil in a large frying pan over a medium-high heat. Working in batches, dip the pieces of fish into the seasoned egg, then place in the hot pan and fry for 1–2 minutes each side until golden and just cooked through. Transfer to a warmed plate, lined with kitchen paper, while you cook the rest of the fish. 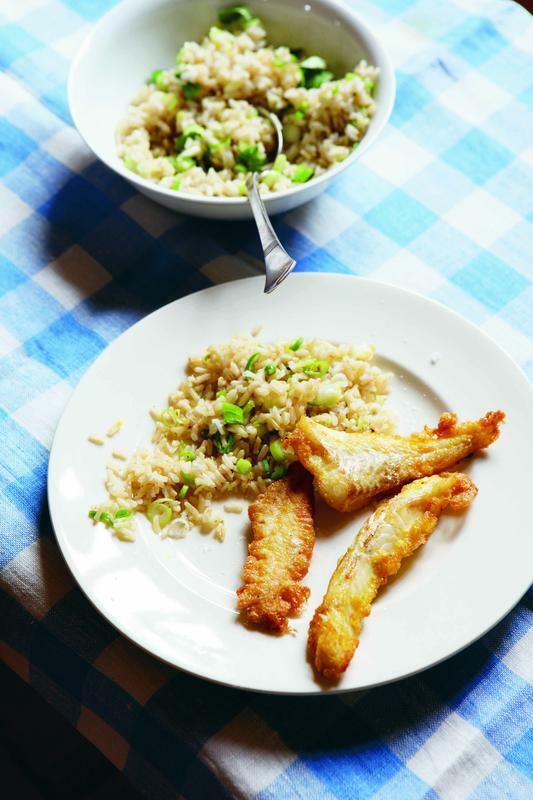 Sprinkle the fish fingers, if you like, with a pinch more salt, then serve alongside the warm spring onion rice.